MAD Image blog – daily posts by our leading stylist team. Simply pick the stylist you like the most from our author’s list, check their posts and post frequency then send them your items directly. L’HOMME Style Magazine for Men is always on the look out for new clothing for monthly look book for men. MAD Image stylist Zachary Zufreur is your direct contact for submissions. KMADD Shapes & Hair Vendors. Unlike other blogs KMADD offers you a unique opportunity to have your items featured on our vendors. Our stylists use items to style shapes and include your landmark & item information in styling cards that customer would use to complete the look – much better way to increase sales than any blog can do, since large number of Second Life players spend most of their time in-world when shopping for fashion. The length of one post is a day, the length of one vendor is over 12 months – our style cards are permanent advertisement for your business. KMADD Designer Showcase is located in the central location in our Fashion District @ KMADD. We feature designers on monthly and bi-monthly basis. Exclusive item/or recolor and FREE item for KMADD visitors applies. Approval required. No cost involved. KMADD Male & Female Fashion. Male & Female Fashion District is located @ KMADD. We are always on the look out of new and inspiring designs that compliment our products and fit within KMADD style. For all inquiries please contact Jax Aster (KMADD Fashion Manager). Commission of 30% and FREE for KMADD Visitors apply. MAD Agency group Shows & Fashion Shows. 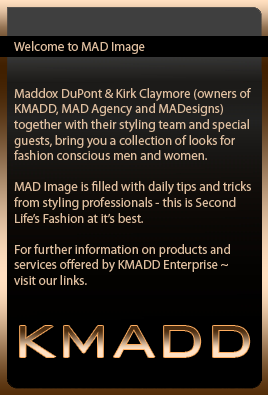 KMADD owns one of the leading fashion agencies in Second Life that has been in existence for nearly 5 years. With clients like LeLutka, Cheerno, Leezu and others and our involvement in MODAVIA Fashion week as a principle sponsor you can be confident that your designs will be presented in the best way possible. MAD Agency does quarterly group shows for which we source designers to participate in. To obtain more information on what MAD Agency can do for your fashion brand go here. High resolution photography and quality poses are used in creation of each style. Our stylist use shadow photography and quality backgrounds to deliver photos of exceptional realism and quality. You are welcome to use any of the images for promotion within your store and group as long as you link it back to MAD Image blog. For maximum exposure please send your items to Jax Aster & Zachary Zufreur (MAD Image principle stylists) as well as any stylist of your choice and Maddox DuPont (KMADD owner). Send an IM to at least 1 person advising that you are sending your items. Please ensure your folder contains the following: landmark to your main store, original vendor with photo and if you like a brief history/designer statement (that we can use in our posts). We prefer the following permissions: copy/mod/no transfer – this also allows us to fit items properly and certainly will ensure your creations are used on more than one occasion as they will not get lost. We prefer that your items come on all layers – jacket, shirt, undershirt, pants and underpants. This will help with mix and matching clothing with other designers. Please ensure your items are properly named – example: KMADD – Woolen jumper – red. We like to feature all designers – big and small. If your product meets our quality standards and is original that is all we care about. Although our Designer Directory contains content creators that meet our rigorous quality standards it is impossible to list everyone all at once. If you are not listed in our directory please do not get offended – just send a note card to Maddox DuPont with landmark to your store and if your greatness has been overlooked we would certainly add you.